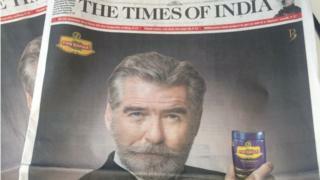 Former Bond star Pierce Brosnan has left Indians both shaken and stirred after his appearance in an advertisement endorsing a product that many associate with a highly addictive and dangerous form of chewing tobacco, writes the BBC's Ayeshea Perera. The advertisement is a mixture of suave Bond "cool" mixed with the kind of superhuman action one generally associates with south Indian films, where heroes are known to take out entire gangs by just looking at them. Armed with nothing but a bottle of Pan Bahar mouth freshener, Brosnan proceeds to take down an entire cartel, pausing once every so often to kiss the jar in his hand. The 60-second advertisement is nothing short of a mini film. It features hired thugs, a party, a woman who is actually a spy, and of course a face to face encounter with a dastardly villain. But the reaction in India has been anything but positive. Many have associated Pan Bahar with pan masala and gutka, a potent mixture of tobacco, crushed betel nut, lime, and clove among other ingredients. It is chewed (and subsequently expectorated in bright red streams) by millions of people, who get addicted to its mildly psychotropic effects. Both pan masala and gutka have often been described as the scourge of the South Asian subcontinent, as it has been linked to serious illness like mouth cancer and tumours. Many Indian states have, in fact, banned the open sale of the products and have run a series of campaigns designed to discourage people from buying them. And although the product Brosnan is endorsing is neither a pan masala or gutka, the reactions have ranged from anger to disappointment. However, Ashok & co, the company that produces Pan Bahar, told the BBC that the public outrage is the result of "public misconception". "We are the oldest brand of mouth freshener in India and we don't produce either gutka or pan masala. But after the 1990s when gutka flooded the market, all mouth freshener products also got a bad name," a spokesman for the company said. "We are trying to change that perception and this is a first step." The spokesman added that the company had thought Brosnan was "perfect" to endorse their product because he was "suave, cool and a master-blender" - all qualities they want people to associate with Pan Bahar. The reactions indicate that they have an uphill task ahead of them.